At its December 4th Regular Meeting, in a series of unanimous 5 to 0 votes, Council approved the hiring of a Mobility & Parking (MaP) Manager, the formation of a MaP Fund, and the creation of a MaP Advisory Board. Council voted to keep 100% of any future parking revenues in the new MaP Fund, overriding the initial staff recommendation which had 30% of revenues going back into the General Fund. Council also elected to add two at-large positions to the Advisory Board making it a 7-person board. Additionally, two council members will join the Advisory board, though in a non-voting capacity. The full composition of the voting individuals on the Advisory Board will be: one recommendation from the Main Street Board, one recommendation from the DTA Board, one downtown resident, one downtown property owner, one downtown property owner, and two at large members. Both Staff and Council prominently referenced the DTA Board and Parking Subcommittee recommendations in drafting and amending the ordinances prior to adoption, including: the expansion of the MaP Manager and Advisory Board duties and responsibility to include broader mobility and transportation demand management objectives, the assurance that all parking revenues would stay in MaP Fund, and the composition of the MaP Advisory Board. Council has previously directed staff to place the issue of paid on-street parking on its January 29, 2019 agenda. The DTA Board continues to look for member feedback on this issue and encourages members to email info@downtownassociation.org with any input. The DTA Board, in consultation with the DTA Parking Subcommittee, expects to issue recommendations to Council related to paid on-street parking in mid-January. Need to catch up on the latest parking news? Click Parking News Posts under the Parking dropdown at the top of this page for a full list of all this year’s Parking posts. At the November DTA Member Meeting, Assistant Director of Community Services Kevin Burke provided an overview of a presentation given to City Council on the formation of a parking management organization, parking benefit districts, and the possible introduction on paid on-street parking in the downtown area. The presentation document is available for download and viewing here. At the conclusion of the November Council Workshop, Council directed staff to place the hiring of a full-time Parking Manager, the formation of a Parking Management Fund, and the creation of a citizen Parking Advisory Board on its December 4, 2018 agenda, but to postpone any discussion or possible action on the implementation of paid on-street parking until the January 29, 2019 Council meeting. The delayed discussion of on-street paid parking is to allow for a full Council to be seated following this month’s two run-off elections and to allow more time for community outreach by staff. 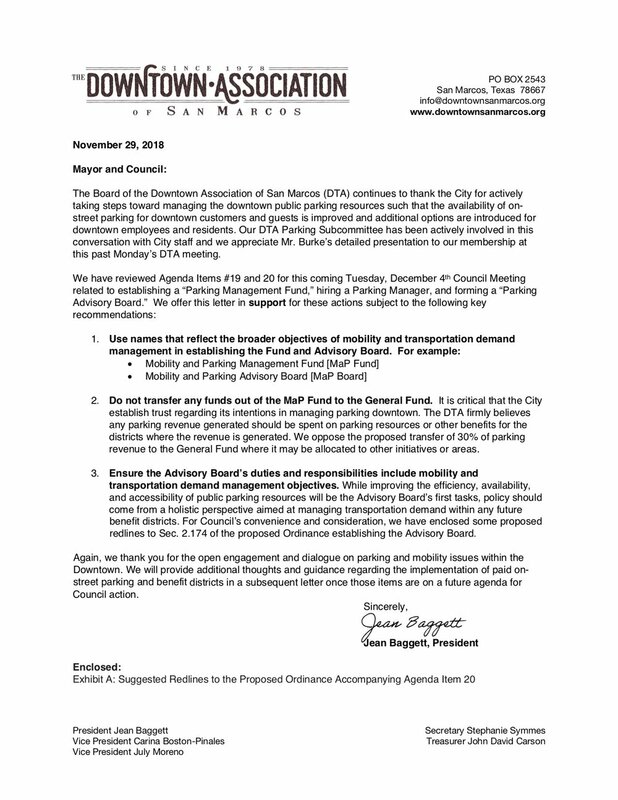 The DTA Board has sent a letter (copied below) to the City Council supporting the parking organization items on the December 4 agenda while offering some recommendations for the ordinance to acknowledge broader mobility objectives for the downtown and to ensure any net revenues from ticketing or future paid on-street parking stay within the downtown area. 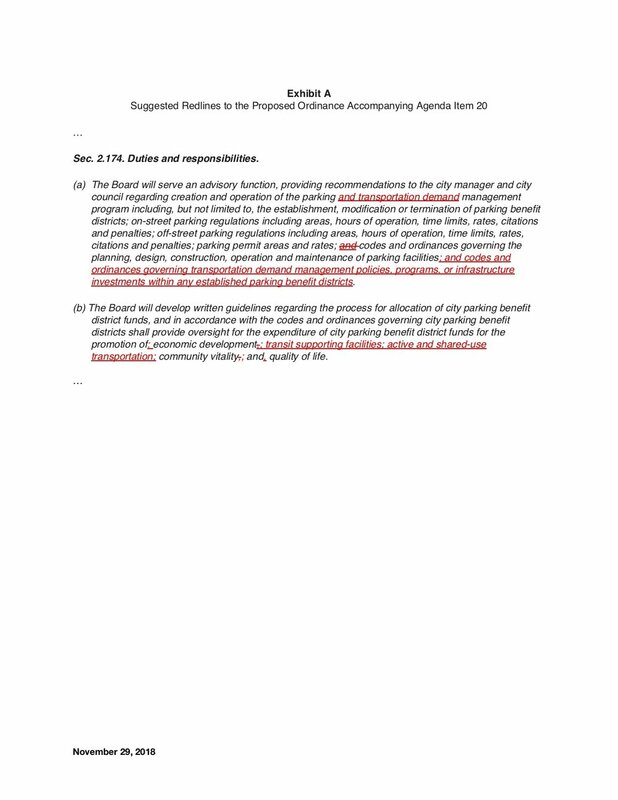 Staff has already taken many of the DTA Parking Subcommittee’s recommendations on these items in the draft ordinance, including a seat on the proposed five person Advisory Board to be recommended by the DTA Board. The DTA Board has not yet issued a recommendation to Council regarding paid on-street parking, but expects to do so prior to the January 2019 Council meeting after consultation with the Parking Subcommittee and reviewing member feedback. DTA members are encouraged to contact the Board via info@downtownassociation.org with any comments or other feedback on paid on-street parking. For more information about the Parking Management Plan, including the Parking Subcommittee’s prior recommendations, please see the previous News post on downtown parking here. After adopting a Parking Management Framework plan in June, the San Marcos City Council will hear a presentation on downtown parking from City staff and the City’s parking consultant, Kimley-Horn, in the City Hall Conference Room on Tuesday, November 20th at 3PM. The presentation will focus on the implementation of the first three action items from the Framework Plan, which would introduce paid on-street parking to a portion of downtown and create a benefit district to reinvest excess revenues from paid parking back into the downtown. The City has already posted the presentation and additional information to be shared with Council as part of the Council’s workshop agenda packet which may be viewed here. The presentation shows that data assessed by Kimley-Horn demonstrated peak demand in the downtown area occurring at 1PM where 19 blocks within the area proposed for paid on-street parking had occupancy exceeding the targeted 85% occupancy rate. Data generated by SMPD’s use of the NuPark License Plate Recognition (LPR) enforcement system launched this year showed a violation rate (e.g., vehicles exceeding the 2-hour time limit) of 10%. According to the presentation, a target violation rate is typically 3 to 5%. The draft phase 1 recommendations include: $1 per hour paid on-street parking Monday through Friday, 9AM to 6PM, from parts of San Antonio Street up to the Texas State University Campus, creation of off-street and on-street 10-hour zones to help accommodate employee parking until additional off-street parking resources are added, and use of Pay-by License Kiosks (in lieu of individual meters) with a Pay-by Cell mobile phone parking app for added convenience. For governance, the draft presentation recommends a hybrid structure wherein the City will hire a Parking Manager, contract with a private parking management firm to run day-to-day operations, and form a five to seven person advisory board to manage parking district policy and have the authority to set paid hours, time limits, and rates — within a limited range — as well as make changes to ensure the District is meeting its objectives. The Parking Subcommittee is made up of Suzanne Riley, Shea Enderle, Jean Baggett, Melissa Hodgkins, and John David Carson with additional guidance from other DTA members that have attended subcommittee meetings or provided input via email. The subcommittee’s full letter to staff can be found here. Staff will present the information directly to Downtown Association members at our upcoming Member meeting to be held Monday, November 26th at 6PM at Shine On Yoga. The Council workshop on November 20th will not have a public hearing component, but will solely be for the presentation of the draft recommendations to Council for their initial questions. Texas Department of Transportation representatives and City staff will host a come-and-go open house from 5:30 to 7:30 p.m. in the Hays County Courthouse Rotunda on Wednesday, Oct. 17. The event will introduce proposed improvements for Guadalupe Street from University Drive to Grove Street. The improvements include striping for bike lanes and parking, as well as sidewalk improvements between MLK Drive and the UPRR railroad tracks and bike/pedestrian crossing improvements at the tracks. Exhibits of the improvements will be on display, and the public is encouraged to attend and provide comments for consideration. For more information contact the City of San Marcos Engineering Department at 512.393.8130 or email to enginfo@sanmarcostx.gov. 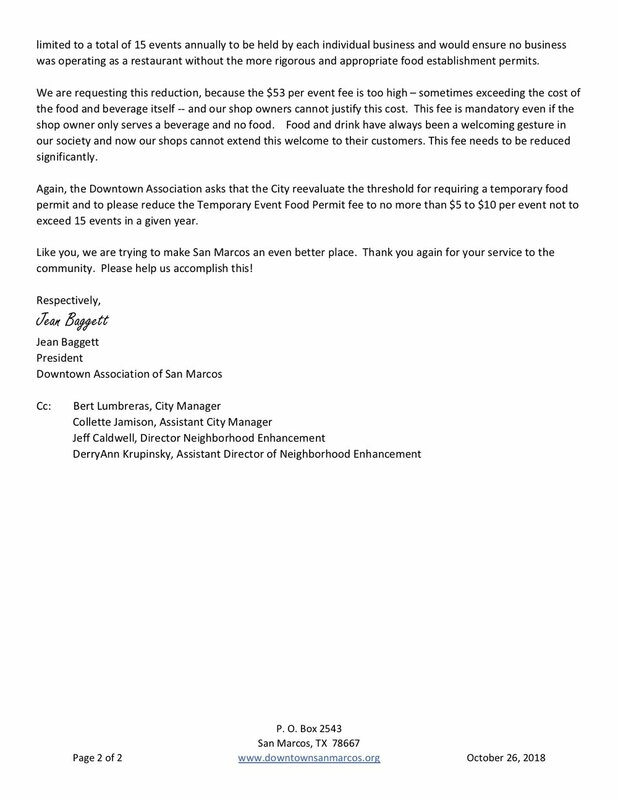 Those who attended the September Downtown Association Member Meeting were treated to a presentation from The Retail Coach to receive the results of its recently completed study commissioned by the Greater San Marcos Partnership and the City of San Marcos to discover more about local shoppers downtown. where Members can dive into the data. The City of San Marcos has recently kicked off the San Marcos Small Area Plan (SAP) Program survey to gather input for specific planning needs in many existing neighborhoods. The City is seeking comments to help establish areas of need, selection criteria and the type of City assistance that should be available to participating neighborhoods. As an Intensity Zone intended for growth by the Comprehensive Plan, Downtown is not a part of the SAP Program; however, many DTA members, customers, and friends live in existing neighborhoods that may participate in the SAP Program. All are encouraged to provide input before the SAP Survey closes October 31. Want to learn more? The City is also hosting and Open House and Presentation on October 24 from 5:30 PM - 7:30 PM at the Price Center. There will be one presentation at 6:00 and one presentation at 7:00. Stop in at any time to view the draft program details and provide your input on the design of the City's proposed Small Area Plan Program.